2-4 times a year, SRLP welcomes members to come learn about the critical work and organizing happening with trans, gender non-conforming, intersex community members and allies, in prison. As a part of the Prisoner Pen Pal Postcard Project, we write messages on postcards designed by Prisoner Advisory Committee (PAC) members and other members of SRLP to be sent to over 70 trans, intersex, gender non-conforming and allied community members, locked away in New York state detention facilities. This is a perfect opportunity to gather as a community to break down barriers and celebrate our art and culture. Beginning in 2007 SRLP provided ongoing communication and support to community members in prison through the community sustained pen pal project. The goal of the Project was to connect New York state based incarcerated trans/gender non-conforming people incarcerated in New York with other trans, intersex, gender non- conforming community member pen pals who have also been affected by the prison and jail systems and allied community members. As some of you may know from experience or can imagine, for community members in prison having ongoing contact with a volunteer pen pal and someone who is committed to working in fighting for justice, has a deep and sustaining impact in peoples’ lives. However, after careful assessment of the pen pal project and as a result of several thoughtful conversations, it became apparent that SRLP needed to re-conceptualize and restructure the project to better support people in prison, pen pal volunteers, staff and the entire project over all. While the pen pal program provided both a valuable and crucial service to our community members inside and outside of prisons, SRLP came to the conclusion that we no longer had the capacity to continue maintaining the Prisoner Pen Pal Project. We are happy to make referrals to other pen pal projects and programs that concentrate on trans, intersex, gender non-conforming and queer communities and we will continue to provide information for those considering becoming a pen pal and to those who want to host letter writing events. We have always valued and continue to value the connections that we have with our community members who are presently incarcerated. The purpose of this shift is not to abandon that work but rather to re-imagine SRLP’s correspondence work in a more sustainable way. 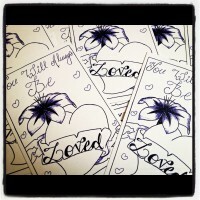 In May 2011, the PPPP project transitioned into the Pen Pal Postcard Project! The Pen Pal Postcard Project hosts ongoing postcard writing parties & provides SRLP community members in prison with 2-4 postcards a year designed by other trans, intersex, gender non- conforming people who are low income and/or people of color. Community members inside will receive words of support and art to keep! Since the transition towards the postcard project we have received a lot of support and excitement from SRLP’s PAC members and postcard party participants.